Our new review section deals specifically with magazines for writers. These are not those which feature writers’ work, but the ones that are directed at writers themselves, to help them improve their writing and get published. We hope this series might help you decide which one might suit you, before you opt for a year’s subscription. 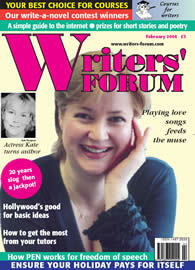 The magazine reviews start with Writers’ Forum, with which we have worked closely over the years. John Jenkins Editor’s Letter, which we reprint at the beginning of every month, comes from Writers’ Forum and gives a little taste of what is in the magazine. Writers’ Forum is full of information for writers. The first section concentrates on offering a series of features, which might range from ‘Inside a Literary Agency’ to ‘Advice from a successful novelist’ from an agent-turned-novelist. Recently the magazine has been serialising The Writing Game by Rosemary Friedman, an interesting and reflective look at a writing life which provides a good change of pace from the how-to articles. Readers’ letters are generously featured and often raise important issues. Throughout the magazine the advice from a series of experts is practical, clear and helpful. Often there are features which give specific advice, such as 'Make a Profit from your Holiday', 'Grow your Talent in a Writers’ Circle' or 'Keep up-to-date to Sell your Short Stories'. There is often a great deal of specific information, such as detailed lists of festivals or writers’ courses. Then there are the special sections, which might include fiction, poetry and a guide to competitions. There are often chances to submit your own work to a series of competitions and to have it reprinted in Writers’ Forum, which is a genuinely thrilling prospect for the unpublished or novice writer. Because this is a British magazine, it will be of most specific relevance to British writers, but there is also a mass of information which could help any writer. American writers might prefer a writers’ magazine which is published in the US, but for everyone else Writers’ Forum has much to recommend it. The tone throughout is friendly and inclusive. It’s pretty middlebrow, in that it primarily addresses writers who are writing in the commercial area, but it doesn’t dumb down either and has something of the tone of voice of a well-informed friend.